Increase customer's loyalty offering easy and convenient login methods such as Facebook and Twitter. Using this extension you can receive rich customer profile data to build long term relationship with customers. Simplify login process and increase customer registration rates. Customers can socially share your website after they successfully registered. Collect rich customer profile data with permission from customer at login. Free Magento Facebook & Twitter Login! Get Magento Twitter + Facebook Login & Registration absolutely free of charge! All Plumrocket Magento extensions are open code so you can have peace of mind and confidence when using our products. Easily Upgrade to Over 50 Social Login Networks! Need more Social Login services? Get Plumrocket Social Login Pro Magento Extension with more than 50 networks supported (including Google+, Hotmail, Yahoo, LinkedIn, Amazon and more). See the full list of supported networks. Allow customers to connect / disconnect single store account to multiple social networks. Multi-social login to the same store account is a premium feature that comes with a Social Login Pro Magento Extension. Display a customer’s profile photo from Facebook and Twitter next to the "User Account" menu or anywhere else on your website. Aggregate verified and reliable profile data, such as email address, full name, birth date, gender and user Id. Enable Twitter and Facebook login on customer login and registration form straight from the Magento admin panel. Display Twitter and Facebook login & registration buttons as well as customer photo anywhere on your site using our extensive developers guide and API reference. As a bonus, allow your customers to share your site with their friends after they have successfully registered using Magento Twitter and Facebook Login. Get Magento Loyalty Program Package from Plumrocket to reward your customers when their friend makes their first purchase using the shared referral link. Reduce cart abandonment rate, increase number of registrations, solve issues with unreliable user data and few return visits by implementing Twitter and Facebook login at your store. Magento Twitter and Facebook Login was designed to work flawlessly on any third party Magento theme. Whether it is your own custom theme or a popular theme like Ultimo, Shopper, Fortis, etc. – it supports them all. Twitter & Facebook Login Magento Extension was designed to help online store owners reach as many customers as possible. Offering Facebook login or Twitter login as registration options is a proven tool to increase the number of clients. We are proud to present this Magento quick login extension because it has a number of advantages when compared to similar plugins you might have seen before. First, we provide a combination of both Magento Facebook login extension and Magento Twitter login extension completely free of charge. Second, your customer’s photo will be automatically retrieved from his/her Facebook or Twitter profile page and added to your online store user account, making it immediately personalized. Third, we have prepared a stunning interface to let you and your customers enjoy their shopping experience to the full. If this is not enough for you to opt for our free Magento Twitter and Facebook Login extension, read the features below to make sure it is the right choice. Customers can socially share your website after they successfully register on your website. If combined with Magento Loyalty Program Package, customers will be able to share referral links and earn rewards when they refer a friend who makes his first purchase. I have used only for Facebook login and I can say that probably it is the best extension doing this thing out there and it is free. You can also print the login block in your templates very easily. Easy to use configurable extension. I recommend it for every one that wants to have job done without spending to much time on making it work. Beside that it is free. Great Extension and free ! I have tried this free extension which fullfills my expectation. I noticed that online users hesitate to go through register process and even I don't like it personally. So I have installed this plugin and I can see improvement in conversion. Users are bypassing the register and ready to login using social media Facebook or Twitter. It makes order process smooth. I have faced an issue with installation. The support team helped to resolve the issue. Overall this extension is good. this free Twitter & Facebook Login Magento Extension is awesome. It serves my purpose of using Facebook login to ease the log in for my visitors. Planning to buy the full version this extension now! I have downloaded and installed the free Version of this Extension before upgrade to 'Social Login Pro'. That's absolute easy and all is like promised. That's why I have already purchased and upgrade to 'Pro' extension. Does exactly what it says and is very easy to install. The setup instructions are very useful. would recommend if you are looking for social media logins. Works as expected and it's really easy to install. Nowadays login from the major social networks is essencial. I's a great extension and it's free. Easy integration, all major options already given and errorless. Good Extension. Currently we only use Facebook login but easily implemented. Easy install and looks good on site. Best and easy to install. This is the third extension I am getting from Plumrocket. I really love how their extensions easily integrate to our magento theme with little to no issues. Easy to install, great plugin. Great plugin, great documentation. The only obstacles/dicifulties I encountered was on facebook's app configuration, but they were resolved. All in all very satisfied by this plugin. Thanks for the hard work! I apreciate it. I use this social Twitter and Facebook connect extension. Its very helpful for me. Easy way to integrate and working well. Thanks for providing me extension like that. it is very fast to install and easy to handle in admin. and it is like must have plugin for a magento store.Great Module, easy to set up & configure!! it's good module for my website! If you need social media account to login your website, you must install this awesome module for magento 2.
it's free and also compatible magento 2.2.3 as well! Good extension... Of course it is Free... Installation is so easy. We are using the facebook login feature in our store. Thank you for the great extension. I used it and it was easy to install and setup. Now I bought the paid version containing a lot of websites. This has been very useful to me and facilitates quick entry for customers. The extension gives a good way to bring users together. Its important if you want to improve engagement. Works in many devices with a responsive layout. I recommend to any store that want to increase sales and social engagement. I wanted to give support to customers of one of my client running Magento 1.9 store for login with twitter and facebook account. I found this extension via. Google Search. It satisfies all the requirements of the core functionalities of such feature having a good admin screen to configure it. Installation of the extension was straightforward with detailed instruction given on wiki with screen pictures. Very east to install and use extension. 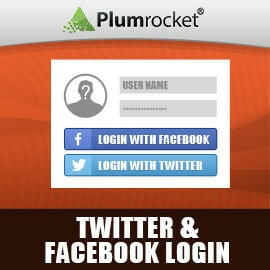 We hadn't thought of implementing a Login with Facebook until we found this extension while browsing Plumrocket products. After a quick installation we fount we were up and running. This version allows for Twitter as well but we have not tried yet. This may sound like an Ad but I'm sure we are going to upgrade to Plumrocket's Social Login Pro as it seems there are many reporting and monitoring benefits. A must have extension for helping your business to grow up and helping people to log in quickly ! I used a social login extension by Amasty but switched to Plumrocket, as with the module I managed to upgrade up to 15 social networks (out of 50) while paying less. I chose this extension because it is great to use as choice for your login. I would recommended it to any one who wants to give their customers a choice of login. This extension works perfectly. I purchased several extensions from Plumrocket, this being one of them. The goal was to have a seamless user experience and this was one of the components. Between this and the popup login, as well as the one page checkout, it makes it incredibly easy for users to register and log in. This is a great tool. Excellent extension, works as described, is very easy to configure and allows you to customize the available social networking buttons. It is a good extension for magento 1.9 ver. Properly working with my store, occures no issues with it. Simple to install & configure, and although I havent needed any support for the magento 2 version yet, I can vouch for the quality of updates and support from my experience with the Magento 1 version. I use this extension for Magento 2. The installation was very easy. I love the options and the usage of this extension. Also is the support very good! The best social login plug in i have used. Good support. They are giving the updates in regular intervals of time. I am using this plugin for the past one year. The best extension I have ever used in magento store. I recommend this module to all my friends and coworkers. Thanks you for the great work and support ! This is a great product. The fix came right away when Facebook changed the way it handled the login. Support was also great and replied to me right away with my question even tho it is a free product they still look after me. Using a Custom Theme makes it sometimes difficult to integrate 3rd Party Extensions. But with the Snippes guided from the plumrocket manual it was pretty easy. (just a few CSS Changes). Thanks for this free Extension! It works, super fine. This extension work flawlessly on my instance, and I appreciate the work from Plum rocket on this free plugin. Users now can login conveniently. Excellent. Its Work Perfectly but "something"
I noticed after logging in, the email address for my client is not correct, and i also tested it with mine also, but its still the same thing. Thank your for your feedback on our free social login extension! We would like to clarify on your review, so that you have no doubts. The "incorrect" email address you refer to - is actually the temp email assigned to the customer upon first-time login to the website. The reason for the temp email address is because some social networks (e.g. Twitter, or Facebook if you used your phone number for registering with FB) do not return user's email address. However, in Magento the email address is always required. Therefore, for customer's convenience and faster registration - we've came up with the "Ignore Missing Data from Social Networks" option. With this option enabled, all required fields in Magento that are missing will be pre-filled with temporary data. Note that once the customer registers at your store, there will be the message shown in Customer Dashboard, notifying that "Your account needs to be updated. The email address in your profile is invalid. Please indicate your valid email address by going to the Account edit page". This will help you setting up our Twitter & Facebook Login extension properly. 5 stars because, easy installation, easy usage and nice and helpful extension! Twitter and Facebook Login is usefull extension for social login. Guide is perfect and extension works stable. Have a M2 version and is free. Easy to configure and really happy with it. This module does exactly what it was intended to do and works flawlessly. This is a great extension. Thanks plumrocket. I really liked this extension, the quality of plumrocket in its services and support make a difference. i use the extension for all my clients, it works perfectly, is one of the best from the market. Thank you for your review! We are grateful for your input, and would like to add a minor amendment here, this might help our other customers understand your review better. Our wiki documentation was not outdated, instead, we showcased the option "Subscribe Customer To Email Newsletter", that was not yet included into your version of Twitter & Facebook login extension yet. This was due to temporary withdrawal of the version 1.4.0 that was about to be released, and which was (unfortunately) showcased in our wiki. In other words, you were reviewing the wiki of the version 1.4.0 while still having the version 1.3.0, that is why you did not see the mentioned option. This confusion was resolved fast and we let you know about the release of the version 1.4.0 the same day. Yet, we appreciate your attention and will do our best to maintain our wiki manuals at the best level! I have tested extension Twitter and Facebook social login and it works perfectly. In 5 minutes I configured extension. Good and easy interface. It's a really good extension! It's a very wonderful extension. so nice. and work perfectly. I like it . This is the Must Have Extension! Easy to install and customize, and Support is great. Yes I recommend this extension for everyone. Easy install and minor CSS conflict fixed very fast. Just one click login solution for new customers. This extension does exactly what I wanted unlike some others I tried. I feel the option of integrating the site with Some of these social Media sites, gives my site more credibility. This is great extension to use.. Easy to configure and use... We are using it for Login and Register with Facebook.. I was looking for such extension... and this is perfect for our needs..
Great Module, easy to set up & configure! Its great to see a company offer free products to its customers, especially when they are as useful as this one. Its easy to install, and have proper documentation for customization.. I'm working on Magento 1.9.2 with the included templetates for checkout and Register (can choose this option in the Magento Backend). Works perfect with my system and template/styles without touching the code. I guess, I will upgrade to the +Version in the next days. Makes adding Social Login Super Easy! Forget about complicated Social login Integrations, this extension is turn key and super easy. Once you add your Facebook and Twitter account and API details, it's good to go. If there's any issues, rest assured that these guys will be there to help you out. It is a great pleasure to leave my testimony here about this great extension. It was very easy to install, I had some problems due to some core changes from my store, but I contacted the support team, they answered me immediately investigated the cause of the problem and made the necessary changes for me. Best of all is that this is a free extension and received a great support. Yes I recommend this extension for everyone, and also this great service support, congratulations to the developer team !!!!!! I was looking for a FB login extension and tried quite a few free ones. I had almost given up on free ones and was thinking of going for a paid one. This one was the last one I tried and I am glad I did. The extension worked perfectly in the first go. I am using a paid theme and the login button did not appear in the login pop-up box. I mailed the support team and they replied back with what is to be done. It worked very well. Easy to install, easy to configure, great support. what else could you want? it is very fast to install and easy to handle in admin. and it is like must have plugin for a magento store. I was waiting for this extension for long time. I used to use another company's plug-in, but this one is very good, compatible and gives me many options and flexibility. Added callbackurl field on the storeviews to the social networks configuration.